I know that this is going to be a “duh” moment, but the big epiphany that I had about wedding planning is that you’ll spend all your time compromising. We’ve found that everyone has an opinion and most of those opinions conflict. A lot of what the wedding has become is a meld of ourselves and the people closest to us. We’ve tried to insert ourselves in every nook and cranny so that it comes off as ELENA! AND! DAN! From the invitations that I letter pressed myself to the place cards Dan designed, the wedding will be as much us as we can make it. We’ve also tried to make the wedding as southern as possible. Call it a theme wedding, but we really wanted to highlight the parts of the south that we love. Dan may hail from Pennsylvania, but that boy is a sweet tea devotee. We’ll be serving pulled pork barbeque, our tables are named after plants indigenous to North Carolina, and our first dance is to The Luckiest by Chapel Hill natives Ben Folds Five. Along the same lines, I’ve been trying to flavor the wedding extras with southern touches. As a thank you to my amazing bridesmaids, I planned a really special bridal luncheon. My father took the five of us out on a sound cruise around the Beaufort/Morehead area and we sipped champagne, nibbled on fried chicken and pineapple, and finally, partook in a charm cake. 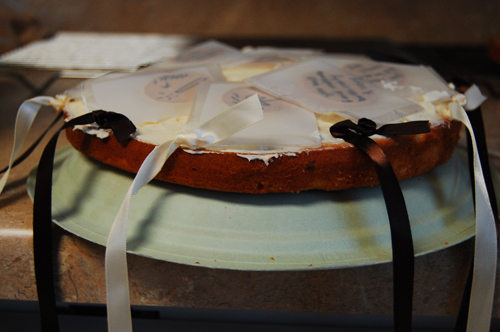 A charm cake is part of a traditional southern wedding. Essentially the idea is that it’s a fortune telling cake. You hide charms inside the cake attached to a ribbon, and each of your bridesmaids pulls a ribbon and finds their fortune! Usually the charms are similar to something you would find on a charm bracelet, different charms mean different fabulous things for the receiver. The baby carriage charm means that the bridesmaid will be having a baby soon. The engagement ring means the bridesmaid will be getting engaged soon. 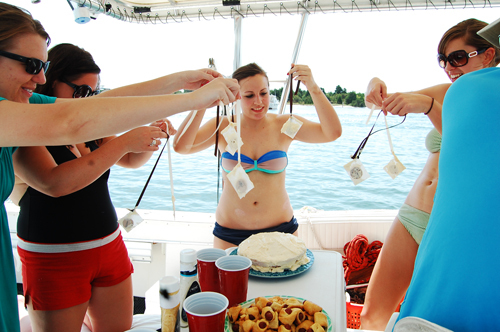 The anchor means the bridesmaid’s life will be stable. But I didn’t want to foretell that my sisters, best friend, and cousin would be BABIED! and MARRIED! I’m fine with stability, but I just didn’t dig the vibe of the stereotypical charms. I may not seem it because I am, in fact, getting married, but I don’t subscribe to the whole these-are-the-things-you-must-do-in-life idea. So I decided to make my own charms. A little lighter, a little more fun. So I predicted that my bridesmaids would eat the world’s most delicious taco, or finally get that Hogwarts acceptance letter. Perhaps they will find their face on a cereal box or learn how to smile with their eyes, you know, things every twenty-something woman really desires with her whole heart. 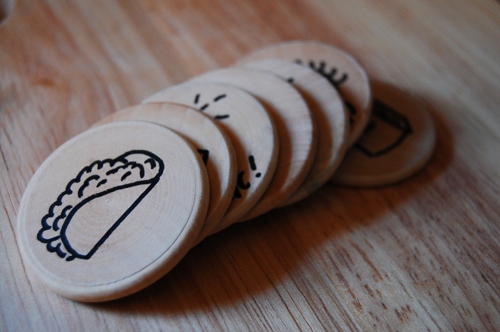 I bought wooden nickels and a felt pen at a craft store and set to work, combining my wit and lack of drawing skills to make eight charms, two for each of my bridesmaids. Some charm cakes are bunt cakes so the charms are just sort of draped over the middle, but I wanted to have the charms in between the layers of cake. Instead of risking the ink leaking into an otherwise perfectly edible cake, I made each charm a vellum envelope and attached the ribbon to that. When it was their turn, each bridesmaid pulled out a charm, snipped the envelope open, and commenced teasing me for what a dork I am. I’m fine with it. As far as the cake was concerned, I wanted something light to compliment the finger sandwiches. 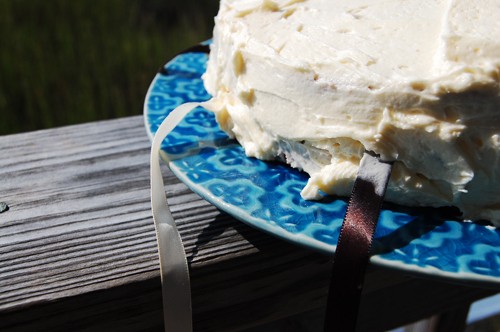 We had the luncheon the same day as the rehearsal dinner, so I didn’t want to be too stuffed by lunch, and thought a white cake with marshmallow icing would be perfect. I made the cake while I was still at home the week before the wedding to save myself time and effort, and just froze the layers. 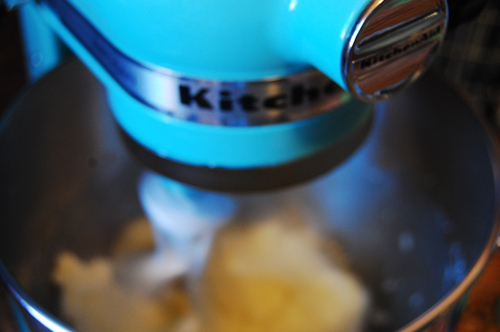 Then, the Saturday before we left, our shiny, beautiful, Carolina blue KitchenAid mixer (a gift from our friend Emily) arrived, and I just had to bake something. So I thought, why not make another cake- a practice run, if you will. And I’m glad that I did. The cake part was fine, but the marshmallow icing I made was not exactly what I was hoping for. I should preface this by pointing out that I’m not really a cake person, I like pies much more, and I really don’t like icing, especially vanilla. This icing was fine by vanilla icing standards, but instead of adding lightness like I’d hoped, the marshmallows just added sweetness. So when I made a second batch of icing, I decided to do so with marshmallow fluff instead of melted marshmallows. The benefit of marshmallow fluff is that it retains the flavor of the marshmallow but has the right texture. I found when I melted marshmallows they just became runny sugar. They lost all of their marshmallow fluff and flavor, which is so the point of marshmallow icing. As a result, the second icing I made with marshmallow fluff, butter, powdered sugar, and vanilla extract. The finished product was light, fluffy, and creamy, the perfect texture and flavor. The cake itself was all together fabulous and the charms were, well, charming. Now wish me luck, I’m off to get married (twice)! Set a rack at the middle level of the oven and preheat to 350 degrees. 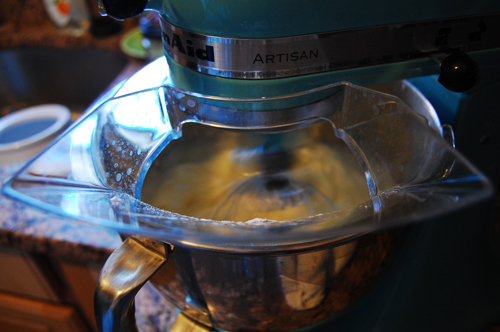 In a large mixing bowl, beat butter and sugar for about 5 minutes, until light and fluffy. Stir together flour, baking powder and salt. Set aside. 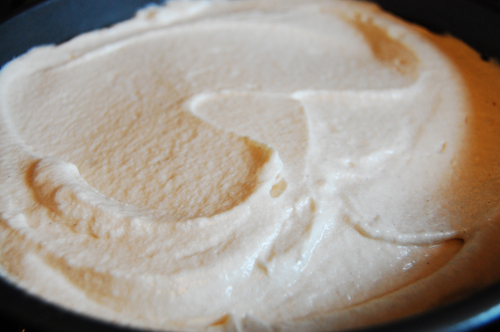 Combine egg whites, milk and vanilla extract. Add 1/3 of the flour mixture to butter mixture then add half the milk mixture. 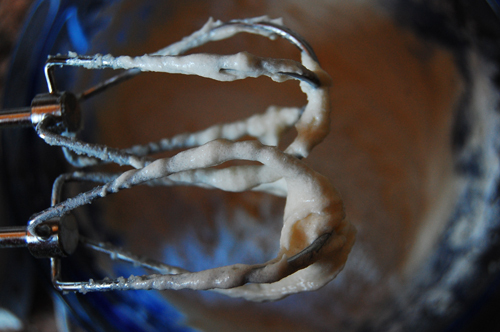 Continue to alternate beginning and ending with flour mixture. Scrape bowl and beater often. Pour batter into prepared pan(s) and smooth top with a metal spatula. Bake cake(s) about 25 to 30 minutes, or until a toothpick inserted in the center emerges clean. Cool in pan on a rack for 5 minutes, then turn out onto a rack, remove paper and let cool completely. Cream butter and sugar. 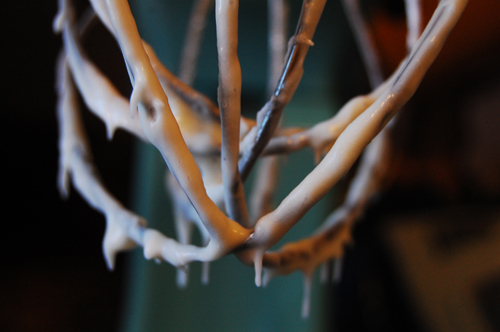 Whip in marshmallow and vanilla. Fast forward to the next night, the party night, when she tells me that the fried chicken bites are the best she’s ever had. TRIUMPH IS MINE. 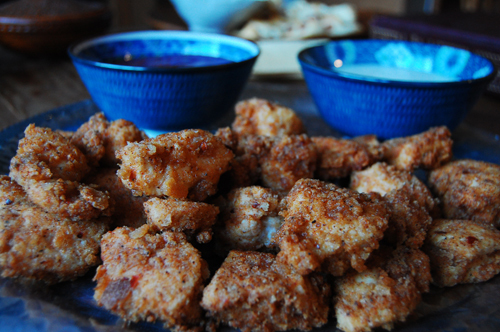 So let me tell you about my fried chicken bites, the best my mother has ever had (this compliment is huge by the way. A genuine food compliment from my mother means a lot to me, she’s an amazing chef and has been in the catering business for years. And the eating business even longer!) Like I said, they’re soaked in buttermilk overnight, which makes them incredibly tender. I also soak them in my favorite spicy food combination- cayenne, red pepper flakes, paprika, garlic powder, chipotle, and s&p. 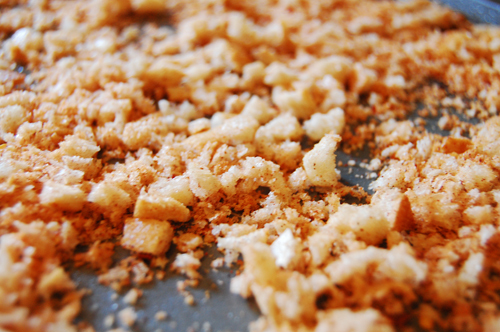 Then, when I’m ready to fry them, I bread them with the same spices, flour, and toasted bread crumbs. Served with barbeque sauce, honey mustard, or blue cheese dressing, they’re amazing. Spicy and crispy and juicy and THE BEST MY MOTHER HAS EVER HAD. Cut the chicken in strips or bites, your choice. Place in a bag/bowl/container. Pour buttermilk over and add half of the spices. Soak overnight. Toast the bread and then dice it. Put in the food processor with the rest of the spices. Blend until you have bread crumbs. Mix with flour. In a large skillet, heat your oil. You’ll know when your oil is hot enough if bubbles form around a wooden spoon. Dredge each piece of chicken in the flour mixture. Fry for 4-5 minutes, then turn. Fry an additional 4-5 minutes, or until golden brown. A few weeks ago one of the connections I made through the Julia & Julie media blitz emailed me to see if I would be interested in participating in another movie’s media blitz. The project/book/movie is titled No Impact Man, and chronicles the story of a family living in New York City that decided to go completely off the grid, to become environmentally neutral. I was intrigued, so I agreed to watch a screener. After watching the movie I felt inspired, curious, and a little guilty about my own impact. I then received a copy of the book, which is less documentary and more educational. The family that did this, Colin Beavan, his wife Michelle Conlin, and their toddler Isabella, didn’t start out as very environmentally friendly people. In the book and in the movie, Colin seems like your typical upper middle class liberal. Exactly the kind of person that the website Stuff White People Like parodies. Exactly the kind of person I am. Michelle was more of a consumer and they were both consummate New Yorkers (take out delivered every meal, etc), but in a lot of ways they resembled most of the people I know. I’m guilty of a lot of the things that Colin points out about himself at the beginning of the book. While I think that I’m a few steps ahead of where they were when they started out, I’m nowhere near as environmentally neutral as I’d like to be. After watching the movie I was given the opportunity to talk to Colin, Michelle, or their producer. I felt as though, through his blog, his book, and his part in the movie (not to mention the countless interviews that started halfway through the project), I understood Colin’s stance. I was incredibly curious, however, about Michelle’s stance. While she was totally supportive of Colin’s project and in a lot of ways pushed him further than he would have gone alone, Michelle and Isabella were along for the ride. And I wanted to know how a year of living No Impact impacted them. I spoke with Michelle on the phone this week, and here is that interview (keep in mind that I’m a foodblogger, not a journalist, and that all of my interviewing skills come from compulsive NPR listening). E: Describe how you reacted when Colin first proposed the project to you? M: Colin had been writing historical nonfiction and wanted to change the direction his career was heading. He got so excited about the idea, and he was so excited that I went all excited and didn’t think through what it would mean. I got all wifey and supportive. An Inconvenient Truth had just come out, so I was open to doing something to awake my political and environmental consciousness. E: How long was it before you started to realize how hard it was going to be? M: By the time we were halfway through, I knew it was bigger that one year, one book, one project. I knew it was a lifechanging thing. E: There is at least one scene in the movie where you breakdown and hit a Starbucks. Did you slip in other ways? M: Caffeine. That was really the biggest way that I slipped, the hardest thing for me to give up. Also, it shows it in the movie, I have really gray hair, I have since I was in my twenties. I had been using vegetable dye as an eco-solution to this problem. I eventually broke down and went to an organic salon. I never slipped on the vegetarian thing though, and that surprised me. E: You have an office job in an era where people are expected to be clean, alert, professional, and put together. How did your coworkers react to both the project and changes in your appearance? M: For the most part, my coworkers were amused about the whole thing. Though I did find out, later, that they thought the lunches that Colin would pack for me in mason jars were, well, a little stinky. I wore a lot of black. Black is an amazing solution when you’re trying to be Swiss Family Robinson in the middle of New York City. Essentially we went off the grid, so work was my reprieve, a place where I had ice chips, air conditioning, electricity. E: You didn’t visit your family at all during the project because of their distance. How did they feel about the project? M: At first, my mom was worried. My sister and sister-in-law, though, were supportive and started making changes in their own lives. By and large they were intrigued and supportive. E: You threw little parties to commemorate each hurdle. What are some things that your friends took away from your experience? M: Everyone was curious. They would talk to us about the garbage shame that they each have. But they were great, supportive, and a lot of them made changes in their own lives. E: I’m so curious about how your daughter reacted. Some parents these days go to extreme measures to mask their children’s food in fun and appealing packages, coating foods with mayonnaise and ketchup. But in the movie, it seemed like Isabella just… went with it. What was her reaction like to each phase? M: Colin actually said that Isabella was our teacher in this project because she is so in the moment, she just lives in the moment. She really did just go with it. And she continues to be that way. It was a lot of fun for her to have the (composting) worms, to do the laundry by stomping on it (in the bathtub). It gave her great joy and the family great joy. I really felt like I was feeling my family in a way I hadn’t felt it before. It gave me the experience of the slow life, the days felt like they lasted forever. It was really delicious, entertaining each other. E: What were some of your favorite moments of the year? M: The night after we gave away the TV, which was my idea because I was addicted to it and I just couldn’t take staring at it, Colin and I were having the most fascinating discussion about something from our childhood. And I realized that we were having that conversation that we wouldn’t have usually had because the TV was gone. Also, we would go to the Washington Square Park fountain. Washington Square Park became like our country club. It’s a public park, but it felt like our country club. And the farm was a life altering experience for me. Something I will never, ever forget. Ever. Finally, and this one surprised me, the day after we ended the project, I was going to the airport with Isabella to visit my family, and I felt sad that it was ending. It was such a special experience together. E: Since the project ended, what parts of the No Impact lifestyle have you held onto? M: Bicycles, the community garden. We have a little community garden plot in Greenwich Village. Isabella wants me to tell you about the squash. We have squash that are so big they’re eighteen inches long and six inches high. We don’t have air conditioning, we don’t need it. No television. We unplugged the freezer because I was only using it for ice cubes and that seemed wasteful to me. We eat local food as much as we can. We do what makes sense. I woke up to how much I wasted and now it’s easy, and a pleasure, not to waste. E: What parts were you ready to give up? M: The bathtub washing machine. E: What is the biggest difference between living high impact and living no impact? M: The biggest difference is that before I didn’t really do the math about what I bought, used, did, and the carbon impact. Now I’m more conscious of what I do. I’m more conscious of what my own impact is. And I found all these unexpected dividends. E: You said in a recent blog post that, despite being heavy on the parsnips, eating local (within 250 miles of NYC) really grew on you. Can you share your favorite recipe? M: Colin’s bread recipe. It was as though I was tasting bread for the first time. I asked for Michelle’s favorite No Impact recipe at the end of the interview because, obviously, this is a food blog and I wanted to be able to tie the whole story and interview into something I made and that you, in turn, could make. I was delighted when she suggested a bread recipe because I’ve been trying to figure out a way to make all of our own bread. I mean, why not? After this wedding I’m going to be swimming in free time, and I’ve been looking for ways to make our lives more sustainable and more DIY. I mean, we make 90% of what we eat from scratch, so why not bread? 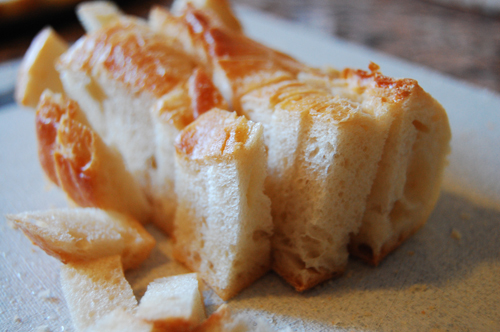 Colin’s recipe calls for a starter, which is a traditional method used in sourdough bread making. Essentially, a starter is an active yeast culture, which you keep alive by feeding it flour and water at regular intervals. It changes and grows, and you pinch off of it to make each loaf of bread. I read that the relationship between baker and starter is complex and intimate, and that you should always name your starter, in the same way you name your car or computer (our electric blue Honda Civic SI is named Bessie. My computer, a MacBook, is named Ulysses, after the President. Dan’s MacBook Pro is named Tesseract after the method of time travel in A Wrinkle in Time. My last computer, which Dan and I lost my sophomore year, was named Bertha). So Dan and I brainstormed, and we decided to name our starter Laverne Cornwallis, after the Scrubs character and the General. Two days later, we woke up and Laverne had exploded over our counter and smelled like throw up. Oops. A little internet research informed us that extreme heat can kill a starter and, naturally, Laverne had been residing in the only spot in our kitchen that gets direct sunlight. Furthermore, Laverene’s character is killed off in the later seasons of Scrubs and Cornwallis surrendered during the Revolutionary war, so I think we set our starter up for failure. Our second starter we named Mr. Feeny, after the ever present teacher/principal/neighbor in the 90’s sitcom Boy Meets World. As a starter, Mr. Feeny did much better than Laverne. Within two days he had the telltale bubbles that indicated it was time to move to the next stage of bread making, the sponge. The sponge is just another step in the fermenting process. 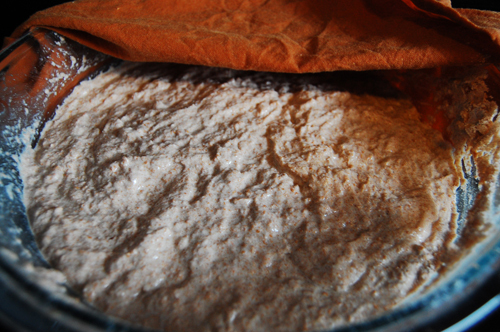 You add more flour and water to your starter and allow it to grow. For the first time following Colin’s recipe, I hit some problems with the sponge. 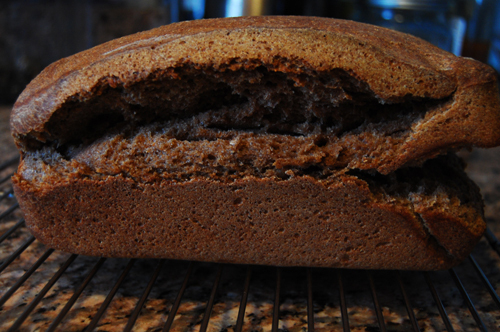 His recipe says that the sponge will look like “a soupy mess.” After adding two cups of lukewarm water, mine still looked like a very stiff dough. I added another cup, and it had loosened up a bit, but not much. After a fourth cup it looked like… well it looked like primordial soup. 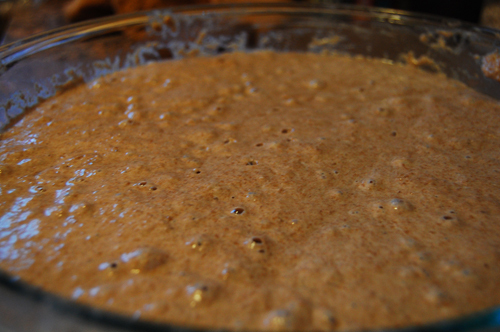 Eventually, after many hours of fermenting, it took on the same consistency of the starter, so I think I did it right. Maybe not. By nightfall my sponge had adopted a certain aroma, one that was not bad like the smell Laverne possessed, but just a little sweet and a little sour. Something that the internet had told me sourdough bread would smell like. 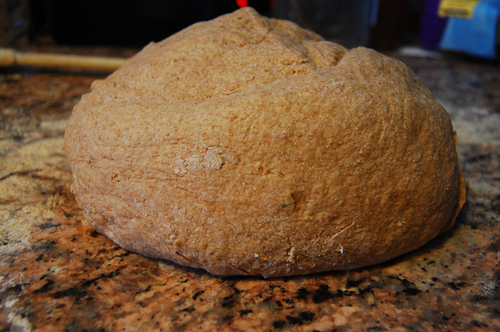 In the morning, after my sponge had fermented about 20 hours, I added more flour and salt, kneaded the dough, and let it double. 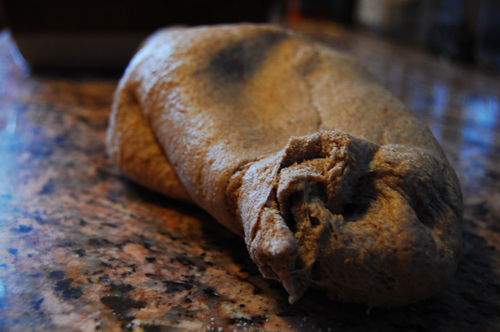 The texture of bread dough is funny. It’s not as spongy as pizza dough, but not as tough as bagel dough. 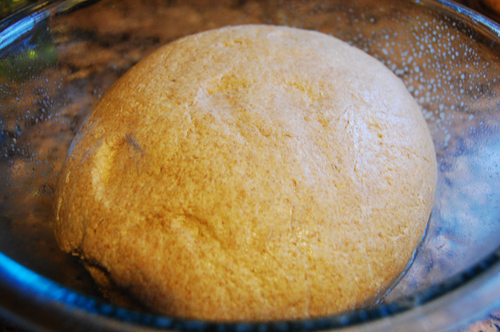 Starter and sponge have the consistency of homemade marshmallow, and bread dough is only one or two steps firmer than that. After the dough has doubled you knead it a bit more, divide it in half, and place it in greased bread pans, where you let it rise another hour. 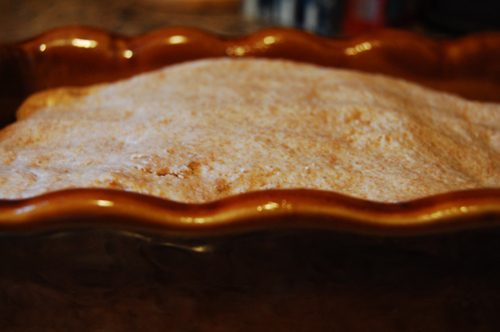 The recipe calls for the bread to bake 40 minutes, or until it makes a sound like a drum when you tap on the base. Mine baked for 60 minutes, but that may be because I added so much extra water, or because of the humidity in the D.C. air during a very rainy September. The bread is allowed to sit for 15 minutes on the counter to rest. After that it can be sliced, served, and enjoyed. Theoretically. My bread was well, as I put it to Dan, it was not quite right. The size and texture was right, it just had a… funk. It was bitter, too sour. 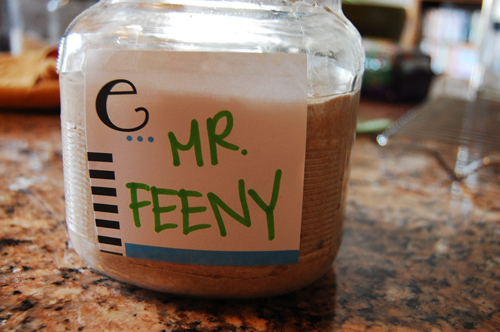 It may be because I added too much water, or maybe my Mr. Feeny failed me just like a disruptive student. It could have fermented too long, perhaps. I don’t think it’s the recipe, and this won’t be the end of my effort to make our own bread on my own, with no bread machine. In fact, in an homage to No Impact Man, I’m taking the bread machine off our wedding registry. 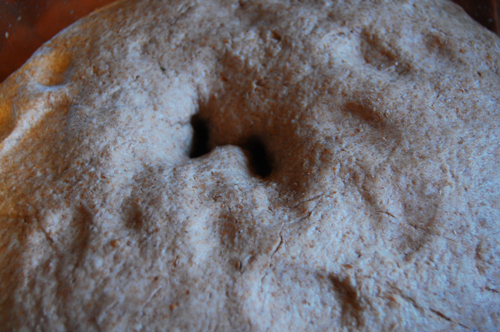 People have been making bread without machines for centuries, why can’t I? I really appreciated the No Impact project. Dan and I have been transitioning, slowly, towards making our lives as sustainable as possible. This project reinforced why we wanted to do that and also gave us the push we needed to go a little further. It’s easy to feel hopeless and like nothing you do matters. I even sometimes panic about the world we’ll be leaving to our kids and think maybe we shouldn’t have kids so that they won’t have to suffer through the consequences of our mistakes. And while the facts presented in No Impact Man are a lot to deal with, I think that the overall message is that one person, one family, can make a difference. If we all think “it’s just too big” and give up, buy a few more bottles of Coke and order Chinese food one more time, nothing is going to happen. But if each of us cuts down just a little, we actually could reverse the way things are going. Colin and Michelle aren’t suggesting that everyone give up toilet paper. They’re not suggesting we all go to the extremes they went to. They’re just suggesting that we each figure out what we can change, what we can give up. Can you grow some of your own food, compost some of your own waste, or even just start shaving with a straight edge razor? And at the end of the day, will you feel more fulfilled, more satisfied, and have also made a difference? Hopefully. 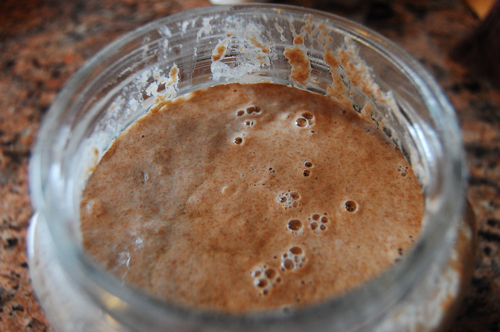 Combine two cups of water and two cups of flour in a jar and shake vigorously. 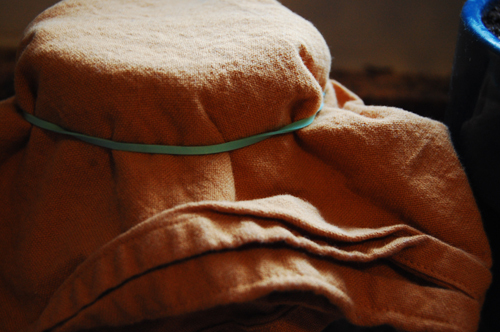 Cover with a cloth and leave someplace warm, stirring once a day. 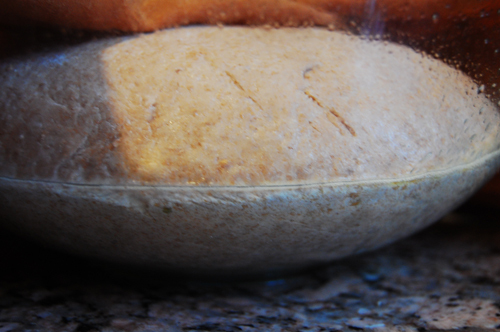 After a few days have passed, bubbles will start to form, and your starter will be ready! If you’d like to make a continuous starter, be sure to set some aside. Combine two cups of starter with two cups of lukewarm water. Stir in four cups of whole wheat flour. It’ll be very liquid, it’s called a sponge. Cover with a wet cloth and let rest 8-24 hours. When the sponge has visible bubbles, add in salt and remaining flour. Dump onto a floured countertop and knead for 10 minutes. 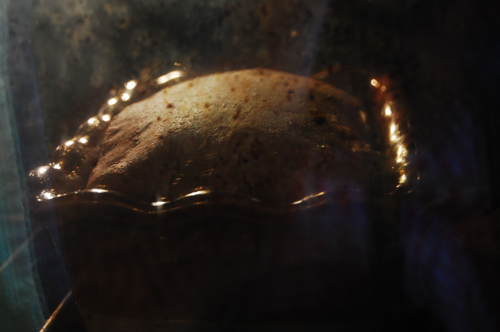 Place in a greased bowl, cover with a damp cloth, and let rise in a warm spot until it has doubled. Break into two loaves. Knead each a little and then put into greased loaf pans. Let them rise in the loaf pan another hour. Bake at 400 for 40 minutes. To test to see if it’s done, tap the bottom of the loaf. It it sounds hollow, like a drum, then it’s ready. Let rest 15 minutes after it’s done. 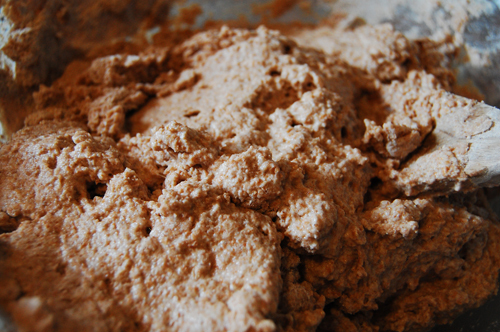 To revive your starter, add another cup of water and and another cup of flour. Then, each day, add a tbsp of each. 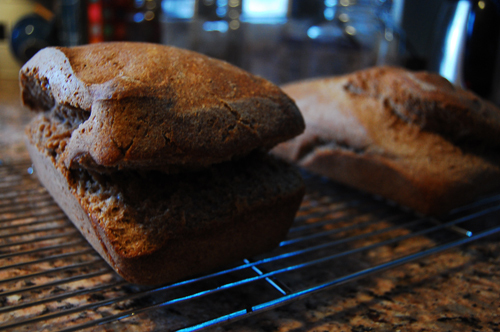 If you regularly take parts of it to make bread, it should stay healthy and active!